One thing that came as a big surprise to me attending college in the US is the exams. Not the fact that we have to take exams, because of course I had to take exams in the UK, too. In the US, exams come up a lot more often than in the UK. I like this because it’s a lot less stressful to swot up on a few weeks’ work than on a whole year’s work (or two whole years’ work as was the case for a couple of my undergraduate courses). Another surprise for me was that they just take place during regularly-scheduled class hours, rather than at a random time, in some room you’ve never heard of, in a building you didn’t even know existed (more stress). However, the most surprising thing was that you don’t get given a booklet in which to write your answers. You have to buy your own. My introduction to this was a line on my first syllabus: Scantron and blue book required for all exams. I had no idea what this meant. My husband was amazed that we don’t have such things in the UK. I explained that they just give you a booklet to write in, and as you fill one book, you raise your hand and someone will bring you another. And another. As many as you need. In fact, perhaps this is one reason why UK colleges have less exams – the cost of all those booklets would really add up. Anyway, a blue book is exactly that: a blue book that says ‘Blue Book’ on the front. 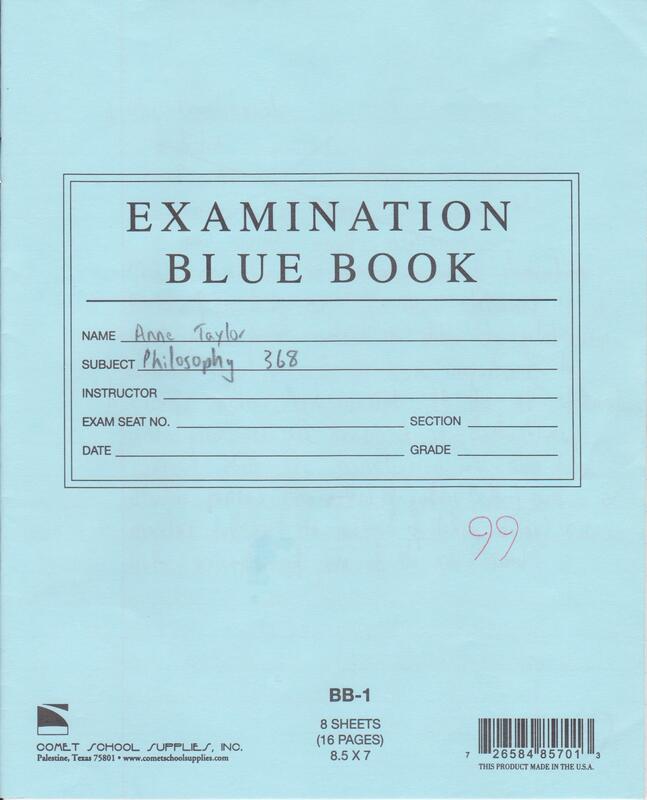 When I saw my first blue book, I was amazed how small it was. I had a little further confusion when my next instructor informed the class he wanted us to bring ‘Green Books.’ Green Books turned out to be the exact same thing only with a green cover and a certain percentage of recycled content in the paper. The second mystery item: the Scantron. It turned out to be a computer-readable sheet for multiple choice questions. As I took my very first Scantron exam, after filling in my name, I read Important : Use No.2 pencil only. I wondered if it really was important or if I was about to fail thanks to my ‘B’ pencil. It was too late to find out if B was anything close to a No.2. In the end, all was well. But my first experience was nearly not a very good one. Now I’m used to it, but at first it felt really strange to BYOB(ooklet) to exams! Oh, and I have a No.2 pencil now. Just in case.